Harrington is five shots off the joint-leaders. PADRAIG HARRINGTON HAS made an encouraging return by carding a two-under 70 in the opening round of the Maybank Championship in Malaysia, after suffering a broken wrist in mid-December. 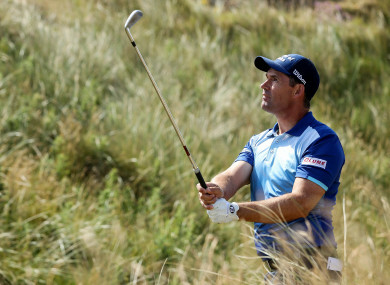 The three-time Major winner hit four birdies and two bogeys to leave him just five shots behind the joint-leaders Marcus Fraser of Australia and Spain’s Nacho Elvira. Harrington previously said that he sustained the injury when he ‘slipped whilst walking down the stairs at home’ but has made an impressive return with his first-round score in Kuala Lumpur. Speaking to the European Tour media, Harrington admitted that he “didn’t play very well” but was glad to be back. “It’s four months since I played a competitive round [so] I’m very pleased. “I really struggled off the tee. It was a really good score at the end of the day, even to come off the last couple thinking I might have made one or two more putts but I holed a couple early on in my round to keep a bit of momentum in it. He added that his wrist feels “ok” since sustaining the injury, but admitted that he is still struggling with his thumb and little finger. Meanwhile, Angelo Que was denied the outright lead after back-to-back double bogeys saw him slip down the leaderboard. His six at the par-four 15th was followed by a five at the next hole – a par three – and although he got one shot back at the last, he remained one behind the joint-leaders. “I thought I was dreaming when I got to nine-under after 11 holes,” said Que. ”But these things happen especially when you play well. You try not to think too much and get ahead of yourself by ignoring it and keep playing. But it sorts of plays on your mind too. Fraser and Elvira, who both started on the back nine, bounced back from bogeys at the 14th to claim a share of top spot, the pair both signing for 65 to leave them seven-under. Fraser was two-under at the same stage before making gains later in his round to reel in Elvira, a 20-foot putt at the seventh a particular highlight. Matthias Schwab and Jazz Janewattananond sit alongside Que at six-under after rounds of 66, while Belgium’s Thomas Pieters is well placed on five-under and veteran Ernie Els is a shot further back in an eight-man group. Email “Harrington makes solid start in Malaysia on return from broken wrist”. Feedback on “Harrington makes solid start in Malaysia on return from broken wrist”.